21DFC Day 0 – Pre-Work: Create Your 21-Day Fitness Plan! This is Day 0 of the 21-Day Fitness Challenge (21DFC) for Feb 2012. View all posts made during the challenge: 21DFC Overview. If you have not signed up yet, please read the announcement post first, then sign up here, before proceeding. Signing up is required to be part of 21DFC. (Update Feb 6: Sign ups are now closed). For the 120+ of you who are already signed up (refer to: official participants list), continue reading! I’ll walk you through each of the sections. Here, you fill out your key objectives for 21DFC. What do you want to achieve in the upcoming 21 days? See this as an intention sheet where you write down what you want to see happen, before they happen. Everything is created twice in reality – first in the mind, then in the physical world. 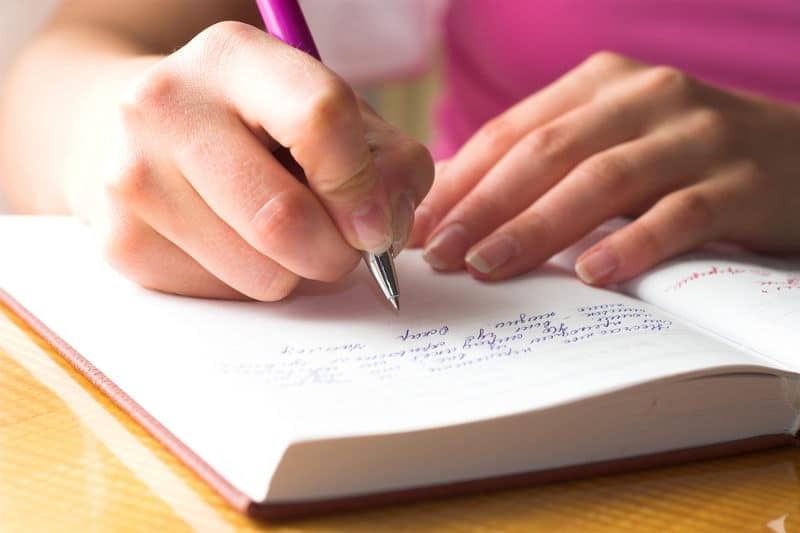 By writing down your intentions, you’ve brought them out of your subconsciousness, and it’s now a matter of taking action that aligns with your goals. The game plan refers to what you’re going to do for the 21 days ahead. See it as a short summary of how you plan to achieve your key objectives in #1. To vary between jogging, swimming, walking and other exercises – Since I’m easily bored by just 1 activity, and need a variation to keep my interest level. Also, varying across exercises help prevent muscle fatigue from working out the same area of my body. Not to see exercising as a chore, but as an activity to be enjoyed and relished in – This is the most important. There is no point doing something unless we truly enjoy it. I want to be exercising because it’s fun and because I ‘want to do it’, not as self-punishment. The latter is a mindset doomed for failure, while the former is more empowering – which is necessary if you want to get the best out of your exercises. Here you see a table with 2 columns – the left side titled “My Biggest Obstacles”, and the right side titled “My Strategy to Tackle the Obstacles”. Here’s what you should do – Fill the left side first, listing the things which you feel will prevent you from succeeding in 21DFC. Then, after you are done, think of your strategy to overcome each of these obstacles on the right side. You should have at least 1 strategy to address each obstacle. Meaning if you have 4 obstacles, you should have at least 4 strategies listed, one for each obstacle. Go slow – Go for quick walks on days where I really, really feel tired. Walk slowly for 1-2 minutes, or as long as I need without pressure, then let it roll from there. There will be results from consistent action. Don’t use the scale in the 21 days. For those who have listed laziness as an obstacle, laziness is always a symptom, not the cause. Long term readers of PE and past participants of Live a Better Life in 30 Days and/or Be a Better Me in 30 Days Challenges would know this. The sooner you realize this, the sooner you’ll overcome this blockade in your life. I recommend to check out the procrastination series to more insights. This is a pledge to solidify your intentions for the 21 days ahead. “I, _____________________, commit to exercise daily for the next 21 days, from Feb 3–23. In these 21 days, I shall stay true to my 21DFC plans as much as possible; I shall push my physical limits to where it has not gone before; I shall be as physically active as I can without hurting myself; I shall report my progress on PE daily be it rain or shine; I shall render my support to fellow participants if they ever need it; I shall not beat myself up if I were to miss my exercises – but instead learn what got me offtrack and not let it happen again. Fill your name in the blank area, then recite it. You can either read it to yourself (either inside your head or out loud), or read it to your 21DFC partner, if you are doing the challenge with someone else. Seriously, try to get a friend, a family member, or your partner to join in if you can, because it’s more fun that way! Last but not least, the 21-day fitness plan! There’s 2 things you can do with this chart. You can either plan out your exercises for the 21 days now, complete with the type of exercise you’re going to do and the duration. This is especially helpful if your days are very scheduled (you work/study fixed hours), and your exercises have to occur at fixed timings (say, gym classes, or in between breaks). Or, you can just go with the flow and do whatever exercise you feel like doing for the day. So, no planning at all. But the definite thing is you will commit to some form of physical activity every day for the 21 days. I’m using a mix of both approaches. I plan to take some gym classes, which will occur on fixed days at fixed timings, so those will be fixed in my schedule. As for the remaining days, I’ll do a mix of either jogging, swimming, or aerobic videos (if it rains on the day), depending on how I feel on the day itself. Focus on increasing physical activity, rather than “exercising” per se. The former is a permanent lifestyle shift, the latter is more of a fad that won’t last. Schedule your exercise sessions into your calendar, NOW. Even if you don’t know what exercise you’ll be doing, or what time you’ll be doing it, allocate a daily time slot for exercising in the next 21 days. That way, at least you already have set aside time for exercising. There are plenty of opportunities to increase physical activity every day. It’s up to you to find them. Be it doing some household chores, walking over driving to the convenience store, climbing the stairs vs. taking the lift, going to the gym for a quick hour during lunch or after work over that extra 1 hour of work which many times make little difference, joining that dance/yoga/aerobics class which you’ve always wanted to sign up for, etc. After you have filled out your 21DFC pre-work, print it out and put it on your noticeboard, right where you will see it first thing every day. 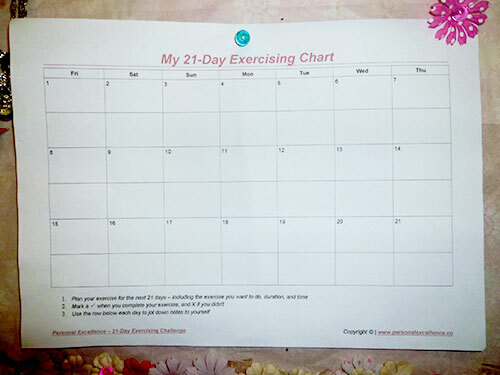 Use the 21-Day Exercise Chart to track your progress – tick for the days you do exercise, cross when you don’t. I’m all for setting high goals and pushing yourself all the way, but if you’re setting targets that are so high that’s making you procrastinate and abandon the exercise plans altogether, then you should seriously revisit your plans. I rather you have something doable and which you stick to, then something that’s sky-high and which you do nothing of. Dump that all-or-nothing mindset and embrace “imperfections” as the new perfection. On days you feel tired, permit yourself to go slow – very, very slow. Then start from there. Soon you’ll forget that you were even tired to begin with. The point is to create the momentum. Regardless of what happens, report back on this site every day, to share your daily progress. Put a daily reminder in your calendar to post your progress here every day. I can’t stress this enough – You have to be part of the community for us to be able to help you. If you don’t log on here, we won’t even be able to reach you. Let us help each other. If you failed to exercise on the day itself, learn why, then share your lessons with everyone here. Then start over the next day. There’s plenty of new tomorrows to start afresh. For #5, you might want to share it in the form of an image. Screen capture your exercising chart first (use the print screen button on your keyboard), upload your image to Photo Bucket or Imgur, share the link in the comments area. And if you want to share your whole pre-work document, you’re welcome to do so. Simply upload it to Google Docs, enable public sharing so members who want to download and take a look can do so, and share the link here. Get Ready for Day 1!